Immerse yourself in the Sensually Luxurious collections. Olivia has created and designed each collection to leave you feeling beautifully pampered. 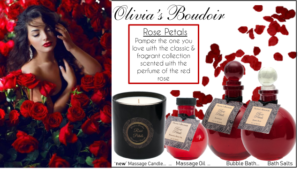 Olivia’s custom fragrances transport you to Love on a bed rose petals, Romance on a Tropical Island and much more. When I need time to myself to relax, I love using the Rose Petals Bubble Bath. Its so soothing and I feel pampered Lots of bubbles and it smells just like roses … Sharon C.
My girl friend and I have tried a lot of massage oils and many of them seem kind of greasy and smell like plastic. But Olivia’s oils really leaves both of us feeling the “Romance” and smelling good … Steve L.